So, bees have stingers. They are pheromone driven and one sting always leads to many more as the pheromones radiate through the hive. 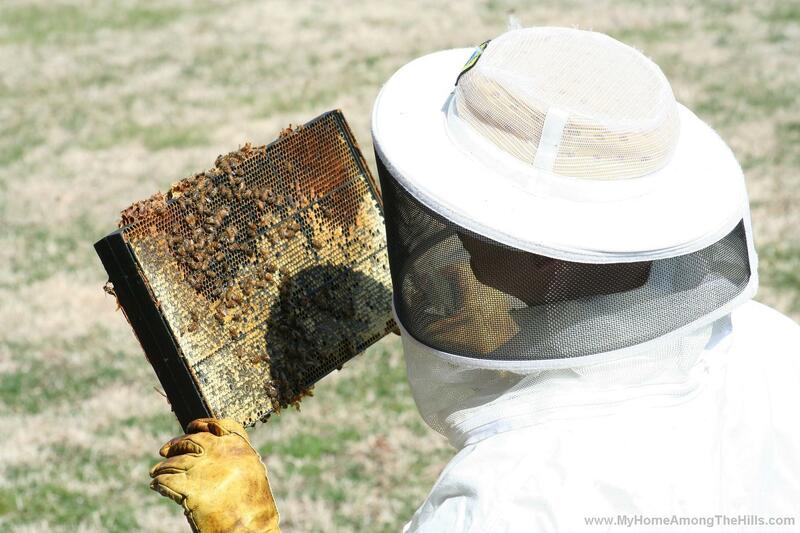 With proper equipment, a beekeeper can minimize the disturbance to the hive which is good for both man and bees! I wear a full length suit most times that I get in the hive. If you react badly to bee stings, it would be important to wear the suit at all times when working the bees (though it is no guarantee…see below). A beekeeper’s suit is typically white (dark colors, wool and some leathers make bees defensive…read: sting). There are several types of veils to protect the beekeeper’s face but in general, they provide a see-through barrier around the entire head of the beekeeper. An interesting note…sometimes bees get inside the suit (sometimes I don’t zip up tight I guess). When they are inside the veil, it is rarely a problem. The bees see “outside” and aim to get there. They rarely sting in those cases. Now, down inside the suit is a completely different story. Anyhow, the arms and legs of the suit are elasticized to keep bees from getting into the suit. Sometimes I wear boots to cover my ankles and sometimes I don’t. A hot hive (i.e. overly defensive hive…needs to be re-queened) finds exposed ankles very quickly…trust me! Typically, though, it’s not an issue for me. Finally, I often wear long gloves with deerskin “hands” and canvas uppers to cover my forearms. 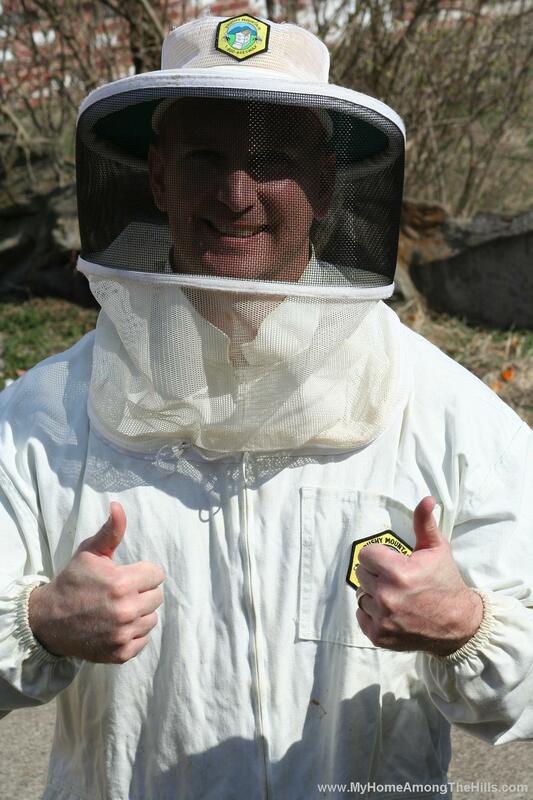 You might think all of this equipment would guarantee that a properly attired beekeeper would be sting-free. I am here to tell you that I have been stung more than once through the leather gloves (though they certainly help). In addition to a good suit, I also carry two hive tools. 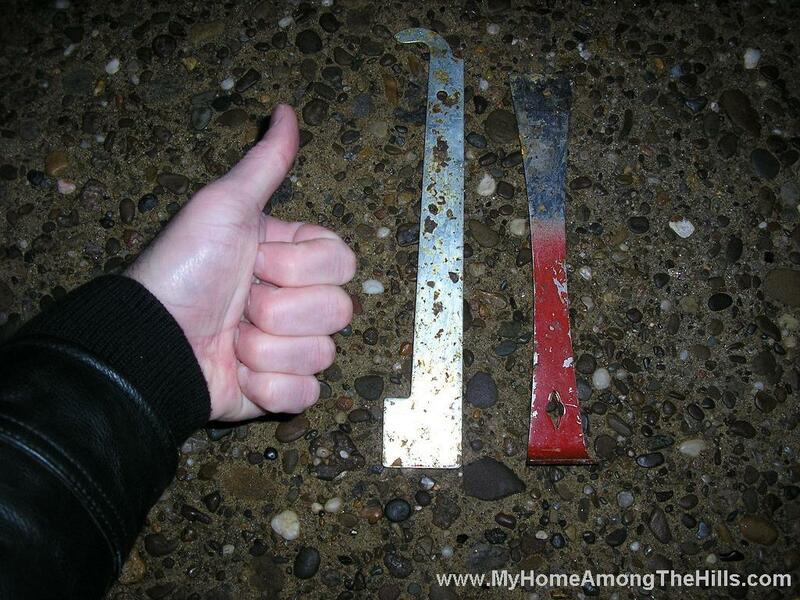 Each tool has its advantages and disadvantages so I just carry both and use them as needed. The red tool has a sharp edge that is good to pry hive parts apart. Propolis, the gummy substance that bees make to seal cracks, is everywhere in a hive and must be pried apart smoothly (i.e. no jerky, sudden movements, jarring, etc). The sharp edge of the red tool is perfect for that work. The silver tool, you’ll notice has a curved hook on one end. It also has a blade similar to the red tool, but it’s not sharp enough for some reason…anyhow, the hooked tool is ideal for lifting individual frames from the hive. The are “glued” to the hive as well and cannot be easily removed without prying. By latching the hook under the edge of the frames, they can be pried up easily for inspection. By using these tools, I can minimize jarring blows and sudden movements which put bees on alert. I tend to go through hive tools like I change underwear though…I need a new one about every month. It’s easy to set them down or otherwise misplace them when your mind is on the frame full of bees in your hands. Save yourself the trouble and order a couple of each tool while you are at it. 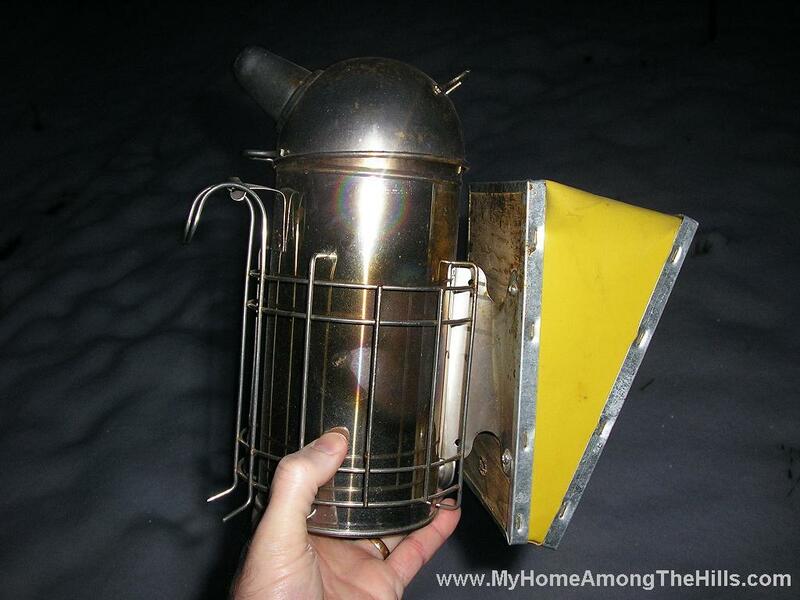 Most people think of billows of smoke when they think of beekeeping. Smokers are used to blow cool smoke into the hive to allegedly calm the bees. When I started beekeeping, I used smoke like any beekeeper. But, in time, I noticed that the bees would flee from the smoke but I never felt like they were calmed. Instead, they gorge on honey (less for me), I end up smelling smokey, and they are ticked when the smoke disappears. I find that if I am patient and methodical and light in my touch, I do not excite the bees and they do not sting excessively. This is a somewhat religious topic among some beekeepers. I’ll just say smnoke has no place in my beeyard. Ok, so we have covered a bunch of stuff this week. If you have an interest in beekeeping, now is the time to be getting ready for the honey flow. If you have bees, they should be ramping up (or soon will be). If you are getting bees, the time is near! Honey season in WV is roughly tax day (April 15) until Independence day (July 4). That’s when the golden magic happens! If they can still sting through that suit, I think I’ll stay home and just observe from here. It’s really super interesting, though! If you sell your honey, I’ll buy some. I’ve heard if you buy honey within so many miles of where you live, it’s more beneficial than buying it off the shelves. Evil Twin’s Wife’s last blog post..My, That’s Interesting! Honey is coming in August! ETW – sure…I’d love to get you some honey…local honey (w/in 50 miles) is purported to be better than honey from farther away. Honey has bits of pollen, etc and local is just better because it’s like an allergy treatment with stuff in your own back yard! Warren SueBee used to put bees on my land in Woodville and they always brought them down in October and moved them back (I Believe Dakota, but don’t get me to liein’) in May. They said there wasn’t enough to eat during the summer and also the heat. Do you have to feed your bees? Now that is some fancy equipment right there. Do your guy friends have beekeeping equipment envy? suchlovelyfreckles’s last blog post..Wanna hear a joke? I can totally see how getting involved with bees up close and personal can totally take on a religious feel! We have more than one friend who keeps hives here, so lucky for us we don’t have to keep our own hive. Natural honey is so DELICIOUS that if we didn’t have such easy access we’d almost definitely have to have a few hives. Can’t wait to find out how you harvest it, etc. Lynnie’s last blog post..Home Again, Home Again Jiggety Jig! Still enjoying the bee info-and still wishing I had some of my own. Youare a pansy wearing the bee suit, Warren. It’s more of a fashion statement though, I’m sure. I kid, I kid. cheesychick’s last blog post..Fuhget abbouttt my last post, here is #4 of 52! St Fairsted – sometimes I have to feed my bees and sometimes not. I usually give them a little 1:1 sugar water early in the spring to stimulate them to get busy. In the fall, it depends on how the summer went. Ideally I would not feed but I also don’t want them to starve. Honey flow is very dependent on water, temp, frost dates, etc. Lynnie – I’ll definitely have a harvest post…but it will be in late summer…stay tuned! tipper – no time like the present! Great info…sorry I haven fallen behind blog reading. I would so love bees, maybe in the future.